With a summer job at Bob & Bob Records in Berkeley, California, teen music junkie Allie is ready for anything. She's poised to fall in love. catch a thief and make a mix that' ll break your heart. and when she blogs as The Vinyl Princess, Allie is the sort of mystery girl you can't resist tuning in to. Get ready for the vinyl revolution! Sixteen year old Allie is an audiophile, obsessed with vinyl and her LP collection is well suited to sit at a museum for music. That's how awesome it is! She works a summer job at Bob & Bob records and feels right at home surrounded by all the vinyl. She hates, hates, HATES freeloaders who get their music off the web and into their convenient little mp3 players. According to Allie the world would be a much better place without them. To voice her passion for music, more so, her passion for collecting LPs, she starts a blog - The Vinyl Princess . Allie lives in Berkeley with her Mom and cat, Pierre who cheats on her with their ghost of a tenant, Suki. 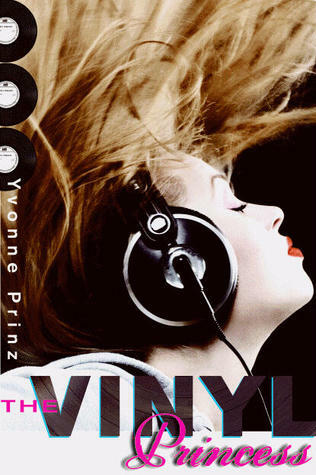 Yvonne Prinz, through Allie, voices a music fanatic's concern for dying-out LPs that are no longer in vogue in a digitally equipped age. I kind of relate to Allie's resentment and need to conserve. As an avid reader and book lover I'm very discouraging of eBooks and eReaders. They just don't work for me. The feel of a print copy in my hands is like a slice of heaven. I'm sure all you book lovers agree with me. Now, what's a YA novel without boy-girl drama? On one hand there's 'M' for the mysterious and drool-worthy, bad-boy he is and then there is Zach, a nerd with an OCD for arranging messes. Who does Allie root for? Read to find out. The other characters make a place of their own in the book. There's Kit, Allie's bff, an "outgoing boy magnet". Shorty and Jam make you giggle with their cross-dressing. An then there is Bob, owner of Bob and Bob Records who shares Allie's passion for vinyl. Well, that was my very first review. Let me know how I did! good job on your first review!! I'm glad you mostly enjoyed the book. It sounds cute. I like books that deal with music...always nice. I recommend author Stephanie Kuehnert if you like music-related books that are more mature. :) She's a favorite of mine!! And I totally agree about actual books. I don't have an e-reader. I'm sure it would be handy, but I just LOVE holding an actual book.